Cisco Lake (also known as Williamson Dam) is located about four miles north of Cisco in Eastland County, on Sandy Creek, a tributary of Hubbard Creek, which is tributary to Clear Fork Brazos River, which is tributary to the Brazos River. The lake is owned and operated by the City of Cisco for it's municipal water supply. The city obtained Permit No. 439 (Application No. 455) dated June 16, 1920 from the State Board of Water Engineers to construct a dam. Construction of the dam was completed September 7, 1923 with impoundment beginning about the same time. The dam as built higher that first planned, so Permit No. 1131 dated December 20, 1929 from the State Board of Water Engineers was granted to amend Permit No. 439. This Permit authorized creation of a reservoir to impound 45,000 acre feet of water. However, because of damage to the roadbed of the Missouri-Kansas-Texas Railroad resulting from backwater from Cisco Lake, the railroad obtained a court injunction against the City of Cisco ordering the operating level of the lake to be reduced to an elevation of 1,496 feet above mean sea level. 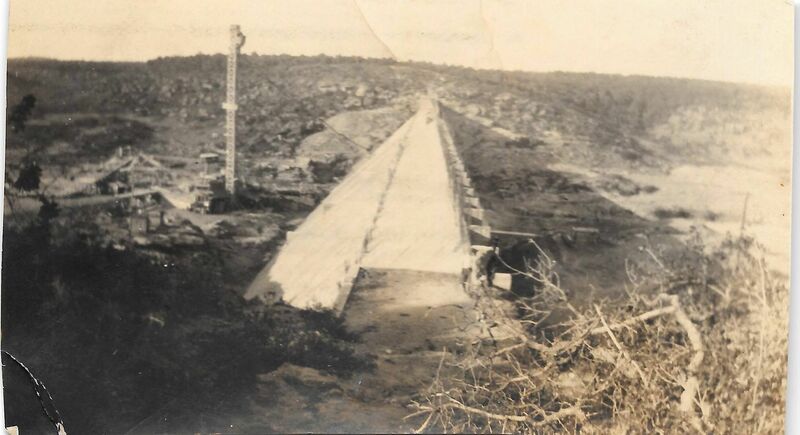 Dam at Lake Cisco nearing completion, circa 1923. This photo courtesy of Cheryl Casey. At this elevation the capacity of Cisco Lake is 8,800 acre feet, and the surface area is 445 acres. Because of the reduced capacity of Cisco Lake, the City of Cisco applied and obtained a new Permit No. 1738, dated January 25, 1955, from the State Board of Water Engineers that authorized the construction of a small channel dam on Battle Creek to store 110 acre feet of water to supplement the water supply. The top of the dam is at an elevation of 1528.5 feet above mean sea level. The uncontrolled concrete emergence spillway is located near the center of the dam, with a crest at elevation of 1, 522.48 feet above mean sea level (NGVD29). The water is pumped through a 24-inch pipeline over a divide into an unnamed creek, then to Sandy Creek, and on to Lake Cisco. The diversion from Battle Creek started in May 1956. According to the stage data posted by the United States Geological Survey, the lake seems having been, in recent years, operated at the original conservation pool elevation of 1, 522.48 feet above mean sea level (NGVD29). According to data from TWDB Report 126, at this pool level, the lake has a capacity of 28,379 acre feet, encompassing a surface area of 1,193 acres. The dam controls a drainage area of approximately 26 square miles, excluding the area controlled by the channel dam on Battle Creek.